Sometimes I post something I just want to buy myself. If I want it then my disillusioned head thinks you will too. 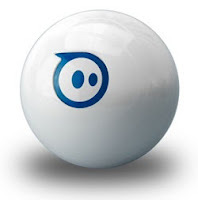 For example, take this Sphero iOS and Android App Controlled Robotic Ball. Today only Amazon.com is offering it for just $85 (reg. $130) and tossing in FREE shipping too. What the heck is this? This video pretty much sums up the awesomeness, but to sum it's the first robotic ball gaming device that you control with a tilt, touch, or swing from your phone or tablet. It can also be used as a controller for games. It's got a Bluetooth connection so it's remote-controlled. You can even take it into a pool (don't take your phone in though), mess with the dog, roll it down the stairs, play tag, even play golf with it. Click here to view the deal at Amazon.com and for more information.